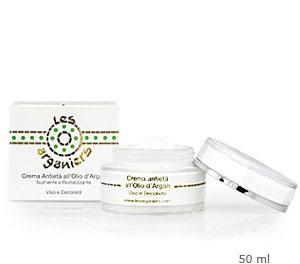 The Argan Oil Antiage cream unites the effectiveness of the ARGAN OIL and E vitamin to a soft and silky texture. Rich of OMEGA-6 and of Antioxidants, contained in the Argan Oil, known for their moisturizing and nourishing properties, helps to protect the skin from the external aggressions, revitalize the skin and helps to slow down its aging. Of pleasant application and easy absorption, the morning is applied, with a light massage, on face, neck and décolleté perfectly cleansed. Excellent as base for the makeup. The evening repeat the gesture or alternatively use the Pure Argan Oil Treatment. Results: The results are visible since the first application; a More compact Smoothed and Bright Skin. Type of Skin: For all the types of skin, also the most sensitive. Particularly suitable for dry skins.